Shopping for a CRM can be a difficult task. There are so many out there on the market. How do you know which one to choose? There are many factors to consider when choosing a CRM. It all depends on what you’re looking for. In today’s marketplace, it’s important to stay connected with prospects and customers at every touchpoint. Customer relationship management platforms help you do just that… build relationships. In order to do that, communication has to be great and the software must allow you to store all follow-up activity in one centralized database. Let’s go through the top 3 things your CRM must have in order for you to get the largest return on investment (ROI). This goes without saying. Your CRM must have a lead management feature that allows you to do one-time entry of new leads, import leads through CSV file and/or capture leads from various other sources. It’s important that your CRM completely eliminates you having to do any sort of double entry. This slows you down and decreases overall productivity. Getting leads into the CRM is half the battle, nurturing them and sealing the deal is the other half. You want to look for a CRM that gives you the ability to add comments to a lead record. This allows you to notate your follow-up with prospects. The comments should be date and time stamped with the user’s name, creating an audit trail. An audit trail helps you do one of two things, 1) Track follow-up performed and 2) See a long-running history of follow-up which can be helpful to another Sales Agent who takes over the account or a new employee (staff can be productive immediately, less hand-holding). 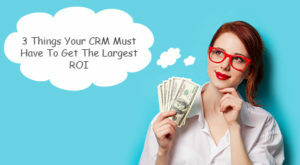 This in and of itself will help you increase return on investment on day one of using the CRM. It’s important that your Sales Agent have the ability to create personal tasks and send calendar invites for meetings with potential customers. Look for a CRM that allows you to do this for each lead. This will save the employee time from having to toggle back and forth between browser tabs and remind them about future follow-up and meetings – resulting in more sales and increased ROI. Being able to perform all of these actions are important but what good do they do on their own? You have to have a centralized place where every single action performed gets stored. Look for CRMs that have a history component built-in. For example, if you’re in a lead record, you should be able to see every single action performed on that account. Similar to the comment audit trail but different in that you’re seeing everything from tasks and meetings completed to outbound emails to documents sent for signature and more. Everything that happens gets tracked with a date and time stamp and current status. You will save so much time with a feature like this. This pays for itself and is crucial for every CRM. If the CRM you’re considering doesn’t have this, seek other options. All of these features point back to lead management as a whole. You’re able to nurture your leads from day one which can increase your conversions by a landslide. If you have the proper tools, you can further streamline the process and increase productivity from day one. Now that you’ve built a relationship with your leads, you have to market to them and sale them your offers. It gets extremely costly to have two different applications, a CRM and a separate marketing automation software. Bundle them together – converged CRMs do a good job at giving you the marketing automation piece without the headache of having to keep two databases in sync. Marketing automation is a must. You can create marketing lists, segment those lists to send the most relevant data, schedule campaigns, and track how well they performed. Since everything is in a single database, the lead record will reflect the lists the prospect was added to and what marketing communication they’ve received. All of this helps you save time and eliminates the dreaded double-entry. Get a CRM with marketing automation and see your ROI soar. Every CRM needs a customer service piece. A lot of CRMs now are not customer facing. This makes it harder for you to help them when they need it most. Look for a CRM that has a ticketing system and knowledge base built in. Think about how much money you’re spending having multiple systems. Depending on your business, this may not be a huge deal. If you have a lot of support emails, it’s easier to have all tickets in one centralized place. You can get rid of managing multiple platforms and wasting a lot of time. With the knowledge base, you can insert canned responses and close out your tickets twice as fast as traditional methods. Make sure to have a solid understanding of your business needs when shopping for a CRM. If your goal is to get a good ROI, you’ll have to consider the challenges your business currently faces and what’s needed to help your business grow. I’d love to learn more about your business challenges. Please comment below and let me know one challenge you’ve faced this year in your business.